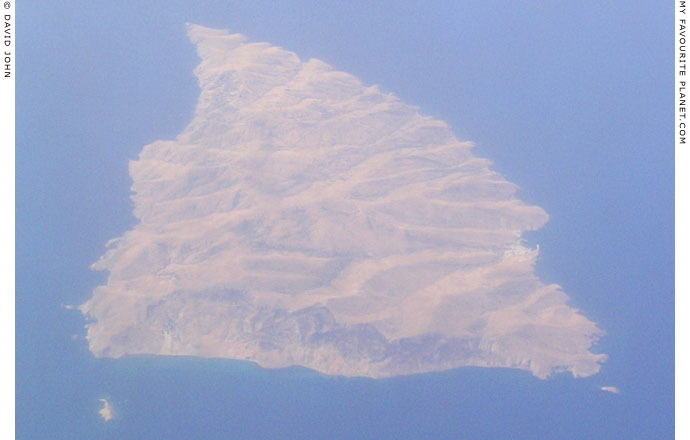 Aerial view of the Northern Aegean island of Agios Efstratios from the north. The harbour of Agios Efstratios, the island's only settlement, can be seen on the right (west). The triangular island of Agios Efstratios (Άγιος Ευστράτιος) has several steep hills, ravines, caves and cliffs (particularly on the north coast). It is also quite windy and arid, with little rainfall and almost no natural water reservoirs. Despite its volcanic soil, the climate makes it unsuitable for agriculture. There are few trees, although there are some splendid oaks, poplars and willows, and some places are quite green in spring and early summer. Most of the islanders live from fishing and raising livestock, although tourism is slowly increasing due to the island's attraction as an isolated, unspoiled and easy-going place, with some good sandy beaches and hiking opportunities, few roads and very little traffic. It has also earned the distinction of being Greece's first green island by supplying all its electricity requirements with wind and solar generating devices. 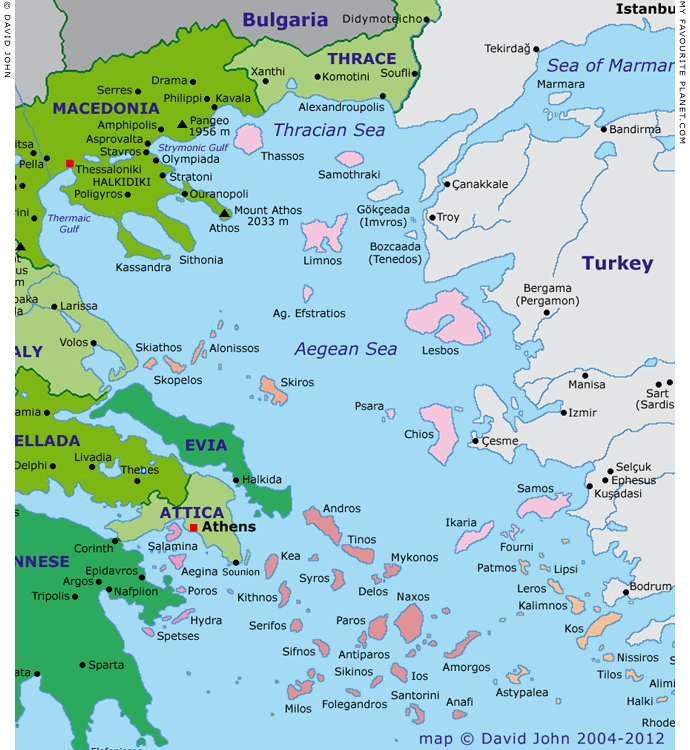 Archaeological finds point to settlements on the island established at various locations in different periods since the 3rd millenium BC, including a Mycenaean settlement, the ancient city of Alonissos (Αλόννησος, mentioned by the Athenian orator Demosthenes) and a necropolis. The island's modern name is due to Saint Efstratios (Όσιος Ευστράτιος ο Θαυματουργός, Saint Eustratius the Miracle Worker), a monk who was exiled here in the 9th century because of his opposition to the iconoclastic policy of Byzantine Emperor Leo the Armenian. During the 15th century, as with other Aegean islands such as Samos, the island was abandoned because of pirate raids, and was repopulated at the location of the present village in the mid 16th century, during the time of the Ottoman Turkish occupation of Greece. During the 20th century Agios Efstratios was one of several islands used by successive Greek governments as a place of exile and imprisonment for political opponents, mostly socialists, communists and trade union activists. Prisoners were held in inhuman conditions, and many died of hunger here. Among the internees were intellectuals, artists, writers and musicians, including the composer Mikis Theodorakis and the poets Menelaos Loundemis, Giannis Ritsos and Kostas Varnalis. On 19th February 1968 many of the old houses, churches, windmills and other buildings were destroyed or severely damaged by a powerful earthquake of 7.2 on the Richter Scale. A reconstruction programme organized by the military junta, which ordered traditional buildings to be demolished rather than rebuilt, altered the character of the village. location: Agios Efstratios is in the eastern Aegean Sea. see our introduction to Greece, Greece page 4: Facts and figures. Length 11 km; width 6 km at its widest point. although maps and other sources do not agree on exact heights. in our introduction to Greece pages. Restaurants: due to the abundance of marine life around the islands, tavernas offer a variety of fish as well as lobster. Local specialities include cheeses such as mizithra, roast lamb dishes and chestnut desserts. Airport: there is no airport on the island, although there is a heliport. The nearest airports are on Lemnos and Mytilini (Lesbos). Yachting: the island's only port has berthing facilites with electricty and water. with reduced services and higher prices. There are usually fewer ferries in winter. although this service appears to have been suspended. from the larger neighbouring island of Lemnos (30 km, 1.5 hours). and costs 20 € per person. We currently have no further information about this service. If you have further information about travelling to Agios Efstratios, please get in contact. Articles, maps and photos: © David John 2003-2016.